Yanshi taixue factory was established and the first production line of direct red began running. The development and production of direct peach, direct orange, and successfully marketed. The first sewage treatment system was bulided. Produced Direct yellow G, Direct red 4BS, Direct blue FBL etc. the second sewage treatment system was bulided. 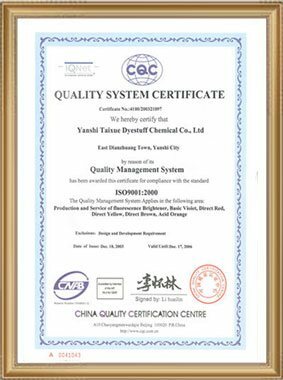 Changed into a joint-stock private enterprise, renamed to yanshi taixue dyes co.,ltd. Liquid dyes and three direct yellow G production lines began running, and the products quickly moved into the international market. Investment of 119.70 million RMB, construction of wastewater comprehensive treatment works on the basis of the existing sewage treatment facilities, the basic implementation of zero-emission. Renamed to Luoyang Taixue Dyes CO.,.LTD. 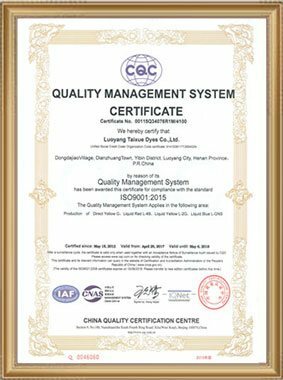 Passed the ISO9001:2015 quality management system certification.Three automatic pigment production lines put into production. Products are certified by German Quality Certified ISEGA CERTIFICATE. 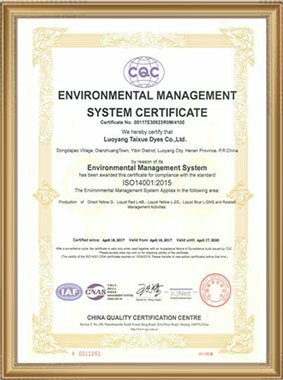 Passed ISO14001:2015 Environmental Management System Certification. Superior quality dyes and matching industry standards and parameters. Environmental protection is the foundation of achieving remarkable development for our company. The concept of environmental protection is implanted deeply into every link of research and development, production and manufacture by us. Classification of dyeing and selection of dyes. Dyeing properties of anionic direct dyes. Dyeing properties of cationic direct dyes. Dyeing properties of basic dyes. A22, World Trade Center, No. 258 Kaiyuan Avenue, Luolong District, Luoyang, Henan,China. Copyright © Luoyang Taixue Dyes Co., Ltd Power by SinoArt.